Any type of workplace injury can have adverse affects on an injured worker and his family, but the more severe an injury is, the more likely the worker is to suffer from additional effects beyond the initial physical injury. For example, Georgia workers who sustain a head or neck injury on the job may suffer from post-traumatic headaches that can persist for a year or more after the original injury, while workers involved in or witness to traumatic accidents on the job may struggle with post-traumatic stress disorder (PTSD) in the aftermath of the accident. If you have experienced post-traumatic headaches or PTSD, and you believe a workplace accident to be the cause, contact our knowledgeable workers’ compensation attorneys at Rechtman & Spevak as soon as possible. A headache is a common symptom associated with a head or neck injury, and the debilitating symptom can persist for months or possibly years following even mild head trauma. In some cases, trauma may aggravate a pre-existing headache condition, but in others, the injury may bring on a headache in someone who has never experienced the condition before. The cause of a post-traumatic headache (PTH) varies depending on the situation, but may be associated with bleeding in the brain, penetrating injuries to the brain or excessive pressure within the skull. 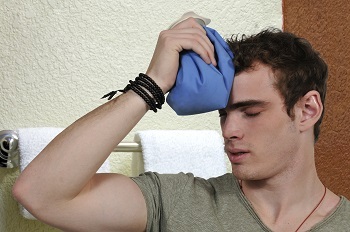 Those suffering from acute post-traumatic headaches may experience relief within three months from the initial head trauma, while chronic PTH may be diagnosed in injured workers when the headache persists for more than three months. In one study of individuals with chronic PTH, 70% of participants reported experiencing headaches in the first year, and in 40% of the participants, headaches persisted for more than one year. Post-traumatic stress disorder (PTSD) is a major anxiety disorder that can develop following exposure to any event that causes psychological trauma. The symptoms of PTSD can be grouped into three categories: re-experiencing symptoms, such as having flashbacks, bad dreams or frightening thoughts; avoidance symptoms, such as feeling emotionally numb, losing interest in once-enjoyable activities or difficulty remembering the traumatic event; and hyperarousal symptoms, such as feeling tense, being easily startled, having difficulty sleeping or having angry outbursts. In many cases of post-traumatic stress disorder, the individual may feel frightened or stressed even when they are no longer in danger. PTSD is believed to be caused by experiencing an event that causes feelings of helplessness, fear or horror, and can be related to a wide variety of events occurring in the workplace, such as a workplace assault, devastating fall accidents, loss of fingers or limbs in an on-the-job accident, or suffering a life-changing injury or illness in the workplace. While it is natural to experience emotional symptoms immediately after a traumatic event such as these, long-lasting symptoms indicative of PTSD can interfere with an individual’s daily life and overwhelm his or her ability to cope. Post-traumatic headaches and post-traumatic stress disorder are two serious conditions that may result from a serious on-the-job injury in Georgia. If you were involved in a workplace accident in Georgia and you have since exhibited symptoms related to either of these conditions, our reputable lawyers at Rechtman & Spevak can help. Contact our Atlanta law firm today to discuss the possibility of pursuing workers’ compensation benefits for your injuries, current and future medical bills, and any physical or mental disability you may have sustained as a result of the traumatic work injury.